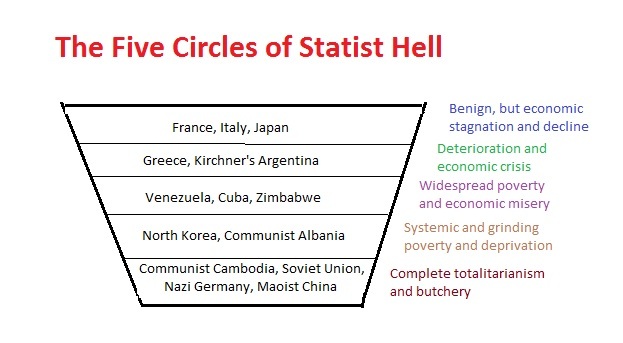 Earlier this year, I borrowed from Dante’s Inferno and created the Five Circles of Statist Hell. At the time, I suggested that Venezuela was on the cusp of moving from the third circle (“widespread poverty and economic misery”) to the fourth circle (“systematic and grinding poverty and deprivation”). Since we now know that children in the country are suffering from hunger and malnutrition, I think we can safely confirm that Venezuela has made that crossing, joining the dystopian hell of North Korea (though you can make a good argument that the savage regime based in Pyongyang actually belongs in the fifth circle). And just in case you need another piece of evidence about Venezuela, consider these excerpts from a surreal BBC report. Venezuelan authorities have arrested two toy company executives and seized almost four million toys, which they say they will distribute to the poor. Officials accused the company of hoarding toys and hiking prices in the run-up to Christmas. Last week, the government issued an order to retailers to reduce prices on a range of goods by 30%. …Venezuela…said…”Our children are sacred, we will not let them rob you of Christmas,” it said in a tweet, along with photos and video of thousands of boxes of toys. …The agency also posted photos of the two executives being marched from the premises by a squad of heavily armed soldiers. Here’s some additional background on the economic situation in the country. This is not the first time Venezuela has ordered price cuts on retailers, or mobilised armed units to enforce it. In late 2013, the country introduced laws allowing the government to fix prices and dictate profit margins. …The same measures have been used to fix the prices of basic products such as flour, meat and bread – but supply is limited in a country where many people go hungry. Before continuing, I can’t help commenting that BBC journalists apparently can’t put 2 and 2 together. The reason supply is limited and people are suffering is because of the price controls and intervention. Anyhow, here are some final passages from the article. The Venezuelan government is becoming increasingly unpopular as the country’s economic crisis grows. …The International Monetary Fund estimates that inflation – the rate at which prices go up – will hit 2,000% next year. Yup, Venezuela is a regular Shangri La. No wonder Bernie Sanders is so infatuated with the place. But let’s focus today on the Venezuelan government’s attempt to play Santa Claus by seizing toys and selling them at below-market rates. I don’t know if this move will be politically popular since that depends on whether ordinary people have some degree of economic sophistication. But we can say with great confidence that it represents terrible economic policy. 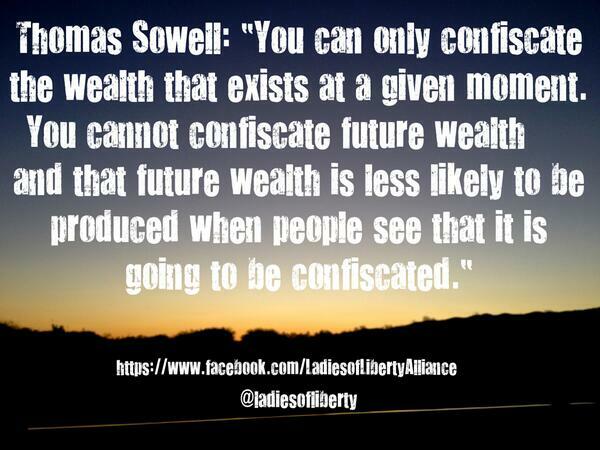 That’s because, as Thomas Sowell has wisely noted, it’s very difficult for a government to steal wealth more than one time. The victims (both the ones who already have been looted and the ones who might be targeted in the future) quickly learn that it’s not a smart idea to accumulate assets that can be stolen by the state. In effect, the productive people of the country learn to behave like the Little Red Hen. In the short run, though, the Venezuelan government gets to play Santa Claus. At least for 2016. But it won’t have that option in 2017. And because the nation’s kleptocratic government is running out of victims, it’s just a matter of time before the system collapses, at which point the government either gives up power or launches a brutal crackdown. Though it would remain to be seen whether the leftist thugs who currently hold power are able to escape the country with all the loot they’ve stolen, or whether they get the Ceausescu treatment. Obama should be real proud of this. Hey, with this problem he can get islam to rule. December 25th brings with it fond memories for me of the Ceausecsus’ fate. They’re all socialist to one degree or another. Nazi is the abbreviation for NAtional soZIalistische – National Socialist. The Nazi party’s full name is NAtional soZIalistische deutsche arbeiter partei – which literally translates from German to be the National Socialist German Workers’ Party. Can Argentina Finally Break Free from Decades of Economy-Sapping Statist Governance?